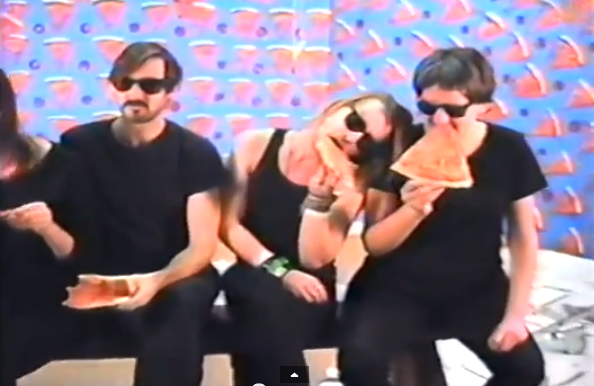 Fresh off Macauley Culkin's residual check for all the Christmas viewings of Home Alone comes the first video for The Pizza Underground, his pizza themed Velvet Underground tribute band. Basically, they take classic Velvet Underground and Lou Reed songs and change the lyrics much like "Weird Al" Yanlkovic so they are about pizza instead of heroin. It's obviously not meant to be taken seriously, but it just makes me wonder how this whole thing got started. They've already played an actual live show, which means they have to be somewhat serious even if it's a novelty act. Plus, where on earth do you get that pizza wallpaper?